Ludwigia repens is found in the tropical waters of North and Central America. It's is a stunning red aquarium plant that grows quickly when it has enough light. It's a favorite plant and a welcome addition to any aquarium environment if utilized properly. Ludwigia repens is an amphibious plant and it grows either partially or fully submerged in the tank. When fully submerged, the leaves range from dark green to brownish red or deep red. The top of the leaves are usually olive green and the undersides contain the red. Ludwigia repens is a good mid-ground plant, or you can put it in the background of a small aquarium. Plant it in large groups to increase the decorative effect, and prune it on a regular basis to encourage bushy growth. Ludwigia repens is a popular, beautiful stem plant that's easy to grow and will thrive in most aquariums that meets its basic needs. The plant typically grows to a height of 12 to 20 inches and the width of each stem is about 2 to 3 inches, based on leaf growth. In order to achieve strong shoots, the substrate ​should be nutrient rich with a high light intensity. Three to five strong specimens can be used for the mid to background area. 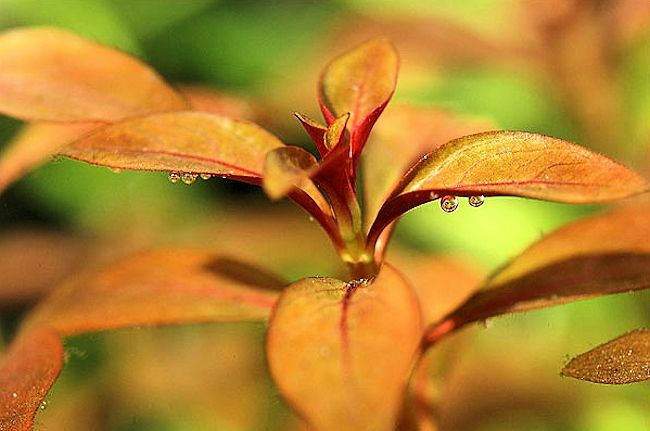 Ludwigia repens can grow well in both very soft and hard water, although soft, slightly acidic water is best. The optimum growth temperature is 75 to 79 degrees, although it can grow in temps from 59 to 79 degrees. It does well with regular additions of carbon dioxide, trace elements and fertilizers rich in iron. The red color is more vibrant and intense if proper lighting is provided; it requires medium to high lighting to do well (2 - 4 watts/gal). If kept in low-light tanks, the color will fade and the leaves tend to fall off. Separate each stem and plant individually. This will result in better growth and the lower leaves will still receive some light as the aquarium plant grows taller. If you break the top off, several side shoots are produced on the remaining stem piece. Reproduction takes place during the warm season when the plant is mature. It develops small, bright yellow flowers above the water's surface. Seeds then develop, drop down to the substrate, and start to grow into a new plant. To propagate the plant, just cut branches off the top and plant the stem in the substrate. Take off the leaves from the last node on the bottom of the stem to ensure proper growth of the root. Don Matakis is the Aquatic Grower & Senior Aquaculturist for freshwateraquariumplants.com.